Scotch whisky brand The Macallan has announced the release of its new Quest Collection, a series of four different single malt whiskies showcasing varying cask-aging styles for the global travel retail market made available at DFS in Singapore Changi Airport from 1 January 2018. The Macallan has unveiled its Quest Collection for global travel retail, a quartet of four different no-age statement whisky variants, that’s inspired by – surprise surprise – travel. The idea for the collection is to encourage us to take inspiring journeys, to adventure to different places, and to boldly go where no one has gone before. After all, going through the airport is pretty much the only way you can pick up any of these whiskies. The four whiskies in the Macallan Quest Collection – the Quest, Lumina, Terra, and Enigma – each pays homage to the journey taken by the different oak types – sourced from Galicia northern Spain nearby to further afield in eastern United States – to make the casks that’s made it all the way to Speyside to age its spirit in. Take for example the entry-level Macallan Quest sees a selection of four different cask types, whose American oak is sourced from over 20,000 miles away to give a soft blend of citrus fruits balanced with vanilla oak. The Macallan Lumina sees a blend of both American oak and European oak in three different cask types to create a bolder, more powerful whisky that’s bursting with creamy vanilla, wood spice, and candied ginger. On the other hand, the oak that’s used to age the Macallan Terra may not have travelled as far – just 10,000 miles – but it is a classic expression of a whisky that’s been aged in first-fill sherry-seasoned oak casks and comes forth with distinctive notes of rounded toffee, preserved fruits and heady wood spices. 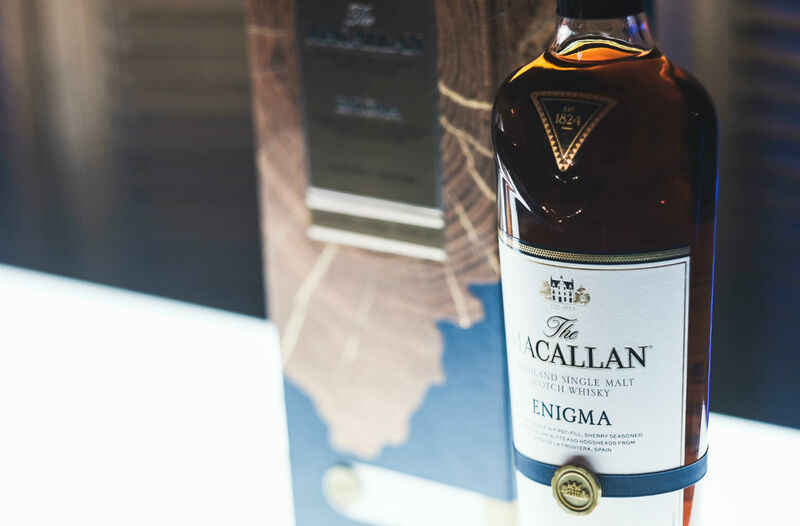 The crème de la crème of the Quest Collection, the Macallan Enigma, ironically is the one least travelled. This pinnacle expression is created exclusively using European oak sherry-seasoned casks from one cooperage in Jerez de la Frontera, Spain, offering a rich and intense single malt that’s reminiscent of vintage Macallan; strong spicy oak underpinned by sweet toasted wood spice, dried winter fruits and a touch of creamy vanilla. The Macallan Quest collection will see its official global first launch to take place at DFS in Singapore Changi Airport from Monday 1 January 2018, and will replace existing core Macallan travel retail expressions. Travel retail prices are US$64 (70cl) and US$80 (1L) for the Macallan Quest, US$100 (70cl) for the Macallan Lumina, US$165 (70cl) for the Macallan Terra, and US$250 (70cl) for the Macallan Enigma.